Collect them all. Those three words put a smile on every marketer’s face and fear in every parent’s heart. “Collect them all,” as you may remember, was kid-code for “bug your parents until they buy stuff,” making you the envy of everyone in third grade. Your goal now: to capture that buyer’s obsession at the level you’ll see in “Superfandom” by Zoe Fraade-Blanar & Aaron M. Glazer. Star Wars is just a movie. To its billions of fans, that statement may seem like blasphemy. To them, Han Solo, Princess Leia and Chewbacca are so much more, and fans prove it with masks, mugs, mats and memorabilia they’ve purchased since 1977, epic plastic light-sabre battles in New York and fan fiction online. So can you create that kind of obsession? Superfandom, the authors say, works like this: “A Successful Fandom = Critical Mass + Emotional Response + Platform.” In other words, give your most fervent fans a place in which they can tell others why they love your product. Offer a sense of belonging, perhaps with a touch of status. Encourage self-expression with product involvement. Utilize social media to the utmost, take good care of your superfans, and license your product so they can flaunt their passion with apparel and other collectibles. Certainly, authors Zoe Fraade-Blanar & Aaron M. Glazer know about their subject: they’re co-founders of Squishable, a company that’s driven by superfans. That first-hand knowledge makes for a more focused book, albeit one that leans heavy. An assumption that readers are tech-savvy or pop-culture knowledgeable may also leave some businesspeople feeling adrift. And yet – help is in here. The authors use abundant cautionary tales to warn marketers away from gaffes, and enough success stories to empower anyone to think carefully of ways that fan-creation may work for them. But will it work for you? That depends. While there are fans of almost every age, this marketing seems to speak to teens and young adults, so bear that in mind. 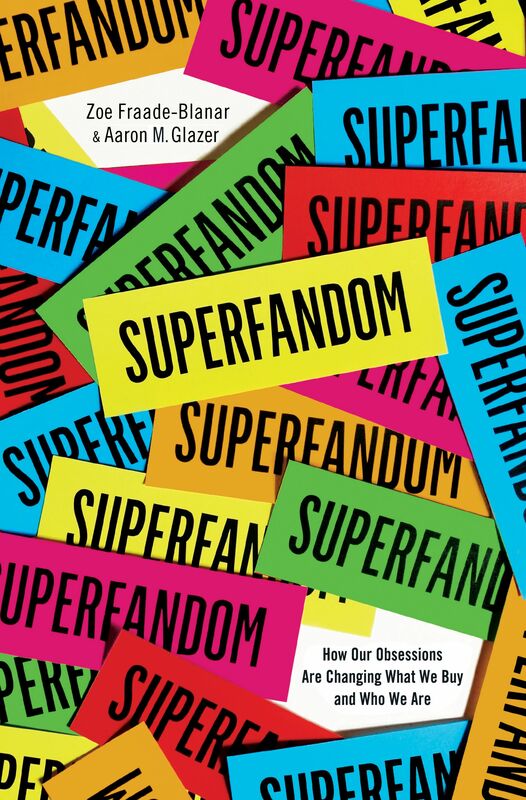 But if you’re ready to hear the cheers of your fan-base, “Superfandom” will make a nice book for your collection.